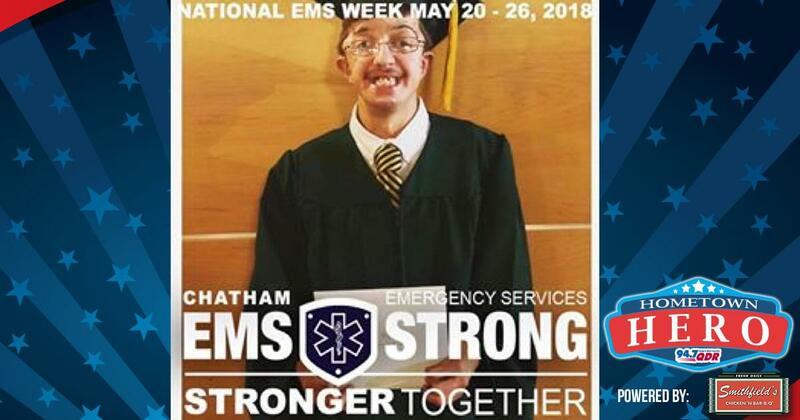 Our Hometown Hero of the week is Josh Glosson, he is a part of the Rescue Squad in Chatham County. Josh was nominated by Andrew Wheeler who shared: Josh was born with Pfeiffer syndrome, causing his bones to fuse. He does not let his disabilities slow him down, he helps lift patients and he assists without hesitation. When people say he can’t do something, he proves them wrong and shows them he can! He’s an inspiration to us at Chatham Rescue. Thank you Josh for your service! We’re sending you a gift card to Smithfield’s Chicken ‘N Bar-B-Q to thank you for all you do!